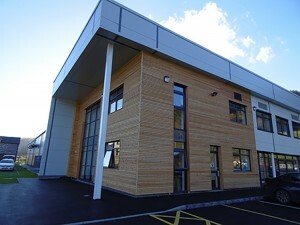 J-Ross Developments Ltd has handed over a new 45,000sqft print works in Llangollen to its client Dobson and Crowther Ltd. The new facility will enable Dobson and Crowther to remain competitive in its industry, helping to support the future of its business. Following a six month construction programme, partial occupation was handed over to Dobson and Crowther in July of this year to enable relocation of equipment to commence. Now that practical completion has taken place Dobson and Crowther will complete its move. The new print works formed a larger development proposal, approved by Denbighshire Council in December 2012. The proposal detailed plans for Dobson & Crowther to be relocated to the new purpose built facility at Climedw, on the outskirts of Llangollen and subsequent construction of a new Sainsbury’s food store and car park on the existing print works site. J-Ross Developments managed the land acquisition and complex proposals submitted to the council. Due to the sites’ location within a World Heritage Buffer Zone, as well as being in an Area of Outstanding Natural Beauty, and alongside a Site of Special Scientific Interest, J-Ross Developments provided an Environmental Impact Assessment to support each planning application. Following consultations with the relevant stakeholder groups and a well-attended public meeting with 65% of attendees welcoming the developments, the proposals were approved. Pickstock Construction will start on the second phase of the development, to build the new Sainsbury’s food store in January 2015. Pickstock Construction will build the shell of the store as well as car park facilities, working alongside Sainsbury’s professional team who will complete the internal fit out. The Sainsbury’s development will create 130 new jobs for the area and offer a convenient alternative for local residents to shop without having to travel to nearby towns.